So, my very first taste of Hemingway. I don’t know why I always shied away from his work before. But a friend recommended adding this to my reading challenge list and I thought, why not. Hemingway has written this story, which is basically about a fisherman wanting to catch a big fish after over eighty days of having caught nothing, in a sparse but beautiful way. No word is wasted. His skilful use of just the right words was enough to place me in the moment. Did he agonise over each word, I wonder, wanting to choose the exact right one? If he did, it doesn’t show; the writing flows effortlessly, like in this description of the old man. In his exchanges with the boy, the sadness and loneliness of the old man’s life are laid bare, along with the deep poverty. Even though I’ve never been anywhere near anyone catching any kind of fish, the way Hemingway described the old man’s struggle to catch the marlin put me right there in the boat with him. 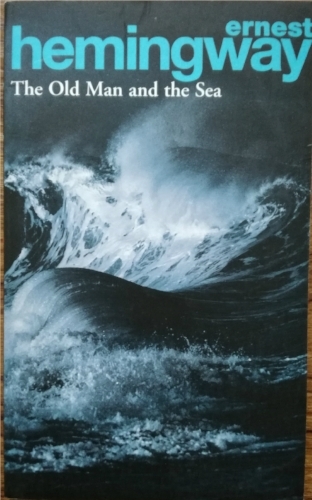 I felt the old man’s annoyance with himself that he hadn’t been better prepared to endure days at sea; I felt his respect for the fish, and his love for the ocean and the fish and birds. The bitter-sweet end left me with a lump in my throat. At only 99 pages, I read it, uninterrupted, in a couple of hours. And I think that’s the best way to enjoy this story, to read it in one sitting. I can honestly say, this is the best short story I have read, one I am happy to rate 5*. In fact, I will go so far as to say, in my limited experience, this is as close to perfection as one can get.